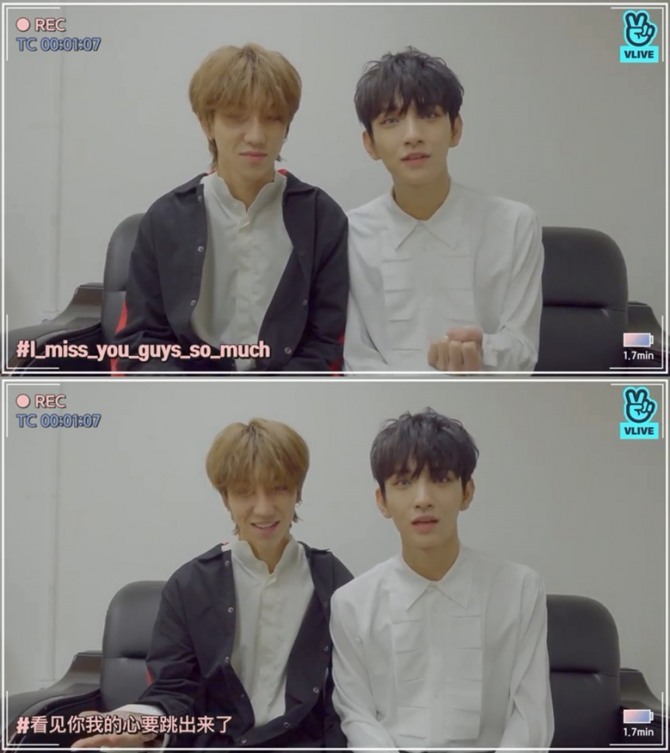 Seventeen members Joshua, who is Korean-American, and The8, who is Chinese, became “English and Chinese teachers” in a video released via Naver’s V app Sunday. “We will teach you the exclamation when you see Seventeen,” Joshua said. The short language lesson consisted of one bandmate explaining the expression and the other bandmate slowly repeating the expression. They taught the fans expressions “I missed you guys so much” and “When I look at you, it feels like my heart’s about to explode” in English and Chinese. Seventeen will participate in the annual Dream Concert, a K-pop collaboration event, set to be staged at Seoul World Cup Stadium in Seoul on May 12. Singer Chung Ha thanked her fans for visiting her fan signing event in a hand-written letter, a V app video showed Sunday. In the video filmed during her fan signing event in Daegu held in late February, Chung Ha was asked to write a letter for fans. The singer wrote a rather long message, for which the video had to play the footage in quadruple speed. “This (marker pen) was too thick that it was difficult to write,” she complained after she finished writing. K-pop girl group April greeted fans after wrapping up its promotion of the group’s fifth EP “The Blue,” in a live broadcast held via Naver’s V app Sunday. “We held our last fan signing event today (for the promotion) but there must be fans who are feeling sad as they couldn’t come, we started the broadcast,” Lee Na-eun said. “Although we are done with the music shows for ‘The Blue Bird,’ it’s not that we are going to hide ourselves until our next release,” she said, referring to the lead track of the group’s latest album. “We are going to hold concerts next week! As we know that you must be looking forward to the concerts, we are working hard on it,” Lee Jin-sol said. “We can keep meeting our fans as we will hold concerts and promote in Japan,” Kim Chae-won said. April will hold a mini concert “The Blue Bird on April” at Shinsegae Mesa Hall at 8 p.m. on Saturday.